With an ever-growing demand for STEM workers, toys that give kids a head-start in science, technology, engineering and maths are increasingly popular, and market leader LittleBits has announced that its new Marvel-themed electronic building block kit is available for pre-order now. The new Avengers Hero Inventor Kit allows budding programmers to become their very own superhero character by making high-tech gear with wearable sensors, an LED matrix light design, and Marvel sound effects. Users can follow in the steps of Avengers characters like Black Panther, Iron Man, Shuri, The Hulk, Black Widow, and more as the accompanying app takes them through ‘superhero training’ and allows them to control their creations and give their gear new abilities through basic block coding. 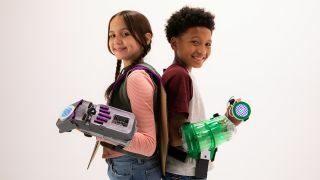 LittleBits’ first wearable is a clear plastic gauntlet that serves as the baseboard for the other components to attach to, and it’s fully customizable with a removable sheath, stickers, and slots for cardboard add-ons. The new Avengers Hero Inventor Kit is another way LittleBits is looking to improve the gender balance in tech subjects. According to its website, around 40% of its kid inventors are girls, “a number that’s unheard of in technology”. The launch follows the success of the Droid Inventor Kit, which was named the Toy Association’s 2018 Creative Toy Of The Year. Superheroes young and old can preorder the Avengers Inventor Kit from Amazon now for $149.95 / £149, with shipping beginning on the August 24; Australian pricing and availability is yet to be confirmed, but that US price converts to around AU$200.